CS Unitec has introduced a new model to its MAB line of portable magnetic drills, the AutoMAB 350, which features an automatic feed mechanism with automatic reverse and shutoff. Ideal for steel fabricators, contractors and plant-maintenance professionals, the AutoMAB 350 drills holes as large as 1.5-in. dia. with annular cutters in structural steel and other materials. Max. drilling depth: 23⁄8 in. with a pilot pin, 43⁄8 in. without a pilot pin. An integrated automatic cooling/lubrication system maximizes cutter life by reducing friction and wear. 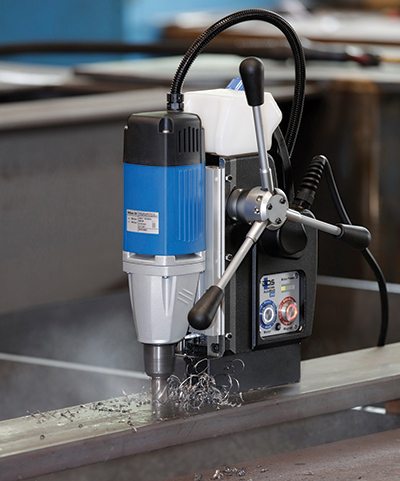 Designed for continuous use, the drill operates at 450 rpm. And, to ensure safe operation, the CS Unitec Safemag system determines whether the magnet has sufficient adhesive force on the material and alerts the user with LED indicators—green for go, red for stop. An electronic safety shutoff sensor automatically shuts down the drill motor if the magnet loses contact.